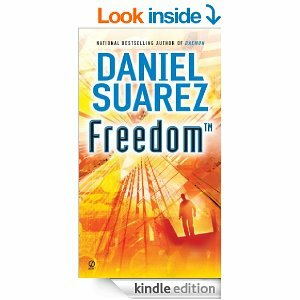 Freedom by Daniel Suarez. 417 pages. Penguin Group. Daniel Suarez has been called the modern-day equivalent to Michael Crichton, and the more I read of Suarez’s material, not only do I agree, but feel that he might be better than Crichton. What I find interesting is that Suarez, as far as I know, still hasn’t quit his day job as a independent systems consultant for Fortune 500 companies. I don’t want to give away too much information, but to me the basic plotline is similar to the much older, but classic Foundation Series by Isaac Asimov. A genius dies and leaves a legacy that influences a few, then more, and finally all of society. But old society doesn’t go easily…. As I said in my earlier review, the first book, Daemon, was phenomenal. This sequel, while not quite as good, isn’t too far behind. What I like about his writing is a combination of multiple characters with plots and subplots woven into a overarching theme that uses plausible, yet sci-fi-like technology. Never in the story did I feel like what he was describing was made up or that Suarez didn’t know what he was talking about. He did his research. And at the end of the story, he tells us where he got his information from. The story is exciting, even more exciting than the first one, with characters changing sides in the battle to either destroy the old society’s approach toward life, or destroy the organization that is making it happen. I initially classified it as science fiction, but like Crichton, Suarez himself classifies it as techno-thriller. Perhaps the only hesitation I have about this one is the same issue I have with many suspense stories–including Michael Crichton. There was a great deal of attention paid to the plot and not enough paid to the characters. The first book established the characters, and did a good job of it, but I felt like Suarez was more interested in completing the story than in telling how it affected each of the people in it. Because of that, I give this story 4 and a half stars out of five.